The Beautiful Cantonment Town Lansdowne is a small Hill station in Pauri – Garhwal district of the Garhwal region of Uttarakhand state. The Beautiful Town of Lansdowne is situated at an elevation of 1780 mtr. Above sea level. The Beautiful Town is south of Pauri enroute Kotdwar and is surrounded by thick oak and blue pine forests offering great mountain views. It is a charming place for a quite holiday as it is devoid of the usual hustle and bustle of other hill stations in Uttarakhand. When we talk about weekend tour destinations, Lansdowne is one of the most popular hill stations of Garhwal region. Lansdowne is the perfect place for Meditation, yoga and rejuvenate your soul. Here you can also experience the adventure activities like, Trekking, Rappelling, Rock Climbing, Bird watching, Boating etc. Lansdowne was originally a popular hill station with the Britishers. Attracted by its salubrious climate and natural beauty, they established a cantonment here. It was founded by the Viceroy Lord Lansdowne in 1887AD , thus the place has been named after him. The famous Garhwal Rifles of the Indian Army has its command office here. At present Lansdowne is a Cantonment town, which is still the recruiting centre for the Garhwal Rifles. On arrival, at Delhi airport/railway station, introduction with Team and transfer to hotel for stay or if time permits enjoy sights of Delhi. Ancient places like Kutub Minar, Red-Fort, India Gate, Crowded bazaars, Temples & Gurdwaras belog to great history of India. Over night stay at Hotel or start joourney towards Kotdwar. On arrival at Kotdwar welcome by our Team and Transfer to Hotel, morning free to leisure. After breakfast drive to Lansdowne. On arrival, go for sight seeing & explore the Beautiful Cantonment Town Lansdowne. Visit the Garhwal Rifles Regimental War Memorial, Regimental Museum, Garhwali Mess, St. John’s Church and Tip-in-Top in Lansdowne. Evening drive back to Hotel. Over night stay in Hotel. Morning free to leisure. Visit Kaleshwar Mandir, St. Marry’s Church, Bhulla Tal,Dugra Devi Temple, Sidhbali Mandir in Lansdowne Late evening drive back to Delhi, Dinner enroute. 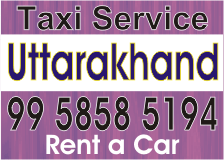 On Arrival Delhi, Transfer to Airpot/Railway Stn. for respective destination. Tour Terminates.